Gail is currently head of Springmoor’s healthcare committee, a group of residents who oversee healthcare services on campus, and work to make recommendations, changes and improvements based on residents’ wants and needs. She also previously volunteered on the Springmoor Residents Association, a group of residents who gather information from all the different resident committees and present their reports to the community’s executive leadership. 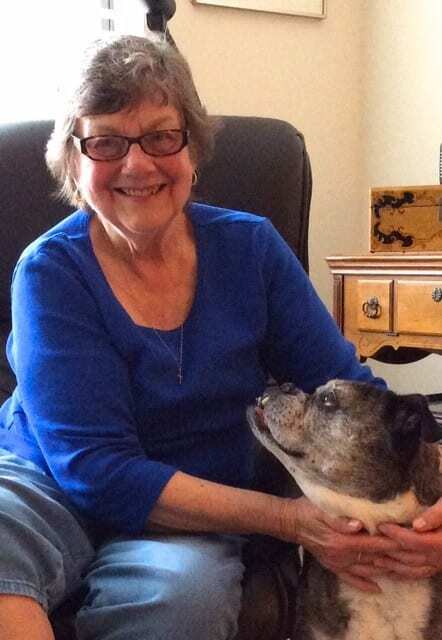 When Gail isn’t volunteering, she relaxes by reading, knitting and spending time outside. She likes to garden in the area just outside her alcove apartment home’s patio, tending to the small plot and planters, as well as walking the beautiful, landscaped grounds of Springmoor. Gail first learned about Springmoor through her church friends who lived there. The beautiful grounds and friendly people initially attracted Gail to Springmoor, but it quickly became more than just a welcoming community; living here would offer Gail the safety and security that was missing from her previous lifestyle. Gail began looking for retirement living options when she became weary of maintaining her townhouse in Raleigh. She didn’t want the burden of having to fix something like a broken heating system or hot water heater when the time came. These fixes would likely be both inconvenient and costly. “The first year I moved here, I went to turn on my air, but it didn’t work. I called down to the desk on a Friday afternoon and the maintenance team came up immediately and fixed it. Within 40 minutes, everything was fixed. If I was home alone, I would probably have been without air conditioning for the weekend,” Gail shared. Gail and her family initially considered building an in-law suite onto her daughter’s home because her daughter wanted Gail to live with her, but the project would have been very expensive and Gail wouldn’t have had the transportation services she wanted, like she has here at Springmoor. “I have a way to get to church and to doctors’ appointments. It was important for me to have a way to get to everybody very easily. I still drive, so it’s no problem, but it would be in years to come,” Gail explained. Gail also had experienced an incident in her townhouse where the gate to her fenced-in backyard had been broken into one night while she was sleeping. She wanted to move to a place that could provide around-the-clock security and peace of mind that nothing like that would happen again. Overall, Springmoor offered Gail the peace of mind she was seeking. If you’d like to learn more about the services available to Springmoor residents, give us a call at 919-651-4844, or visit us online to request your free guide on the benefits of living at a Continuing Care Retirement Community (CCRC).